Gold the previous day in both the Men’s Team and Women’s Team events at the 2018 Asian Games in Jakarta, Indonesia; on Wednesday 29th August, China, with the final still to be played, is guaranteed further medals to add to their collection. Lin Gaoyuan and Wang Manyu meet Wang Chuqin and Sun Yingsha in the Mixed Doubles final; impressive but the outfit to attract the attention on the fourth day of play was Sharath Kamal Achanta and Manika Batra, as India followed the London bus theory. They say you wait an hour for the red bus to arrive and then two follow immediately; it is the same at the Asian Games. 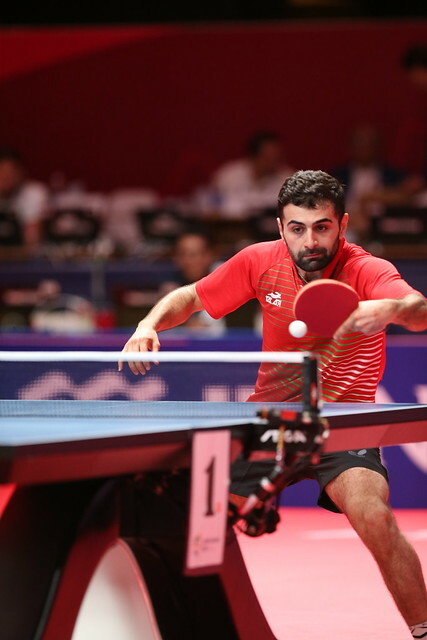 In the Men’s Team event, two days earlier, India had clinched bronze, their first ever table tennis medal at an Asian Games since the sport was introduced in 1958 into the multi-sport gathering. In Jakarta, the no.9 seeds, in the third round of proceedings, they beat Korea Republic’s Lee Sangsu and Jeon Jihee, the no.3 seeds (11-7, 7-11, 8-11, 10-12, 11-4), prior to ousting DPR Korea’s An Ji Song and Cha Hyo Sim, the no.15 seeds (4-11, 12-10, 6-11, 11-6, 11-8) to be assured of a medal. At the Asian Games, two bronze medals are awarded. Understandably it was a delighted Sharath Kamal Achanta. Success against An Ji Song and Cha Hyo Sim, it was a most notable success, one round earlier they had beaten Chinese Taipei’s Chuang Chih-Yuan and Chen Szu-Yu, the no.5 seeds (11-5, 11-7, 12-10). A semi-final place reserved but for Sharath Kamal Achanta and Manika Batra it was to be the end of the road; they were beaten by Wang Chuqin and Sun Yingsha, the no.10 seeds, as play progressed from best of five games contests to best of seven games affairs (11-9, 11-5, 11-13, 11-4, 11-8). Imposing from Wang Chuqin and Sun Yingsha, it had been the same from start to finish; notably at the quarter-final stage they had beaten Singapore’s Gao Ning and Yu Mengyu, the no.11 seeds (11-9, 11-6, 11-5), having one round earlier upset the order of merit by ousting Japan’s Jin Ueda and Miyu Maeda, the no.8 seeds (11-7, 11-6, 11-9). Notably, in the third round Gao Ning and Yu Mengyu had caused a major upset by overcoming Hong Kong’s Wong Chin Ting and Doo Hoi Kem (11-9, 11-5, 9-11, 11-8). Defeat for the Singaporeans but a brave effort, in a tournament that has witnessed a very full schedule. Upsets abundant in the lower half of the draw; in the upper half it was somewhat different. Ho Kwan Kit and Lee Ho Ching like Wong Chin Ting and Doo Hoi Kem from Hong Kong, emerged the bronze medallists. The no.7 seeds, they caused a quarter-final upset by beating Chinese Taipei’s Chen Chien-An and Cheng I-Ching, the no.7 seeds (11-7, 11-8, 11-2), to reserve their place in the penultimate. Most certainly it was a fine effort from the Hong Kong duo, Cheng I-Ching acknowledging the fact their opponents had been most astute. However, as with Sharath Kamal Achanta and Manika Batra, China proved the nemesis. They experienced defeat at the hands of Lin Gaoyuan and Wang Manyu, the top seeds (11-7, 11-7, 11-3, 11-3). Earlier in the quarter-final round Lin Gaoyuan and Wang Manyu had accounted for Korea Republic’s Lim Jonghoon and Yang Haeun, the no.6 seeds (11-6, 11-6, 11-8). The final is scheduled for 7.00 pm (local time) on Thursday 30th August.